Sacramento - odd signs changed from Business 80 to 50 west/east? Okay, so here's an odd one. Looking at Harbor Blvd and the Business-80 intersection (which happens east right after the divide of original 80/Business 80, west of downtown Sacramento), Harbor Blvd calls out for going onto U.S. 50 west/east, even though that part of Business 80 isn't U.S. 50 anymore. Perhaps an old sign, maybe, that hasn't been updated in years? It seriously makes no sense. Why would CalTrans add U.S. 50 (which no longer exists on that segment, especially west to San Francisco) after the proper Business 80 designation was on the signs? You can see this on both sides of the intersection (Harbor coming south to B80, and Harbor coming up north to B80). Re: Sacramento - odd signs changed from Business 80 to 50 west/east? even though that part of Business 80 isn't U.S. 50 anymore. Is that true? I thought the west end of US 50 was at the regular/business 80 junction in West Sacramento, and US 50 went east concurrent with Business 80 to the CA-99 junction, where Business 80 splits off to the north. Wikipedia suggests this as well. I don't think you're crazy. According to the Interstate 80 Business Wikipedia page, Caltrans as around 2016 completed a sign replacement project. 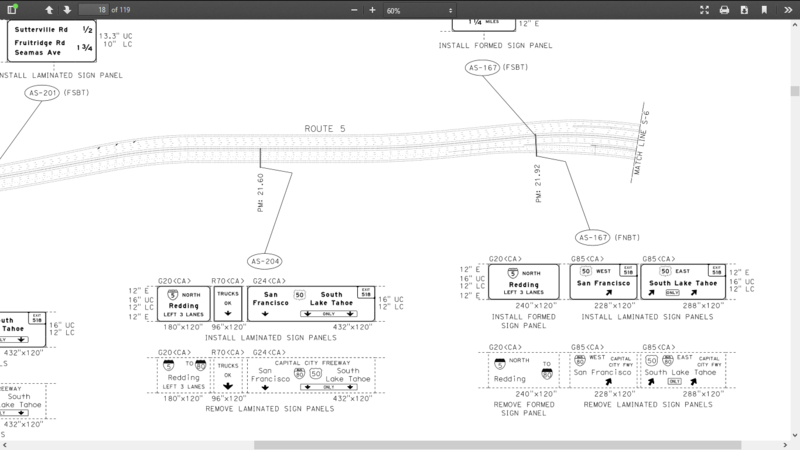 A PDF to details of the project was referenced (http://caltrans.ca.gov/hq/esc/oe/project_ads_addenda/03/03-4F7104/plans/03-4f7104_plans.pdf). The PDF did have details of the old signs being removed, and that the new signs lack the Business 80 designation west of CA 99. Why is that I'm not sure yet. I’m fairly sure this was discussed in a previous thread on this board. As part of the sign replacement project, a decision was made to deemphasize the biz 80 designation along the section concurrent with US 50. The biz 80 designation is now really just signed on the eastern portion of Capital City Freeway concurrent with hidden SR 51. Before 2016, on 80, right before the split of 80 and "former" Business 80, the shields showed both Business 80 and U.S. 50, but in 2017, it's only U.S. 50. Interesting. I always thought U.S. 50 ended at the 99/B80 intercharge, but apparently, it's always been 50 until the split, concurrent with B80. I can understand why CalTrans wanted to simplify and have B80 just end at the 99/50 intercharge. Also, I thought that segment was also scheduled to be U.S. Interstate 305? Google Maps show the 305 shield. Kind of confusing! So, based on that signage, I was truly under the impression that U.S. 50 ended at the B80/99 intercharge, given that signage (I drove through that area a lot when I lived in the Sacramento area). EDIT: I'm sorry, I'm still new to this website. Didn't realize there was an existing discussion thread! My bad. The portion of US 50/Business 80 between the I-80 split in West Sacramento and the 99/50 junction in Sacramento is hidden I-305. The Interstate designation is not signed, but it is kept for funding purposes. Thanks for posting the link to the Caltrans plans. The (proposed) signage for the segment from West Sac to downtown looks a lot cleaner when signed only for US 50. It's a bummer that this will be another road with disappearing co-signage. But it's also interesting how US 50 has been extended westward vs its normal "termination" at the Bus 80 / CA 99 interchange - look back at old/historic maps of the area, one would have never guessed that US 50 would have been extended so far west. Probably should add CA 99 still seems to be silent through the US 50/I-80BL segment. CAhighways.org has way more detail than Wikipedia on the topic. At one point US 50 did extend further west - to San Francisco! The route though did not involve the freeway in West Sacramento at all (which was built as I-80/US 40/US 99E in the 1960s). It followed 99 south to Stockton, then the surface street routing that Route 4 took until the 1990s in Stockton, then approximately I-5 south to Mossdale, Business I-205 west towards Altamont, I-580 west to the Macarthur Maze in Oakland, and I-80 west to US 101 in SF. If their intent was to get rid of BL 80, then they should sign the eastern half as CA 51 and call it a day. I don't think they were trying to get rid of Biz 80, but simplify signing since locals tended to refer to that section as US 50 only. As mentioned in the other thread, the state's highway law stipulates that SR 51 shall be signed as BL 80, but the US 50 portion of the business route didn't have that distinction. I wonder if it would be more correct to sign the road as Business SPUR 80 (and not LOOP 80) since it now only connects to I-80 on the east end. I am still waiting for someone in the Sacramento area to request lawmakers remove that law to eliminate Business 80 in full and allow SR 51 to be signed as SR 51 or perhaps as SR 99. (Yes I know that moves SR 99 traffic away from its implied overlap with US 50 and I-5 and away from its continuation north of the airport, but it seems logical given SR 99 is the through route when traveling through the US 50 interchange heading northbound.) Joe Rouse might be able to tell us if someone is pursuing that goal, since it seems silly to have Business 80 take a spur southwest to the US 50 interchange and end without an apparent reconnection to its parent. If you're going to get rid of the route, might as well get rid of the whole thing, not just the US 50 section. For what it is worth, California in general has deemphasized business routes of any type. Local municipalities typically do a poor job of maintaining signage for business routes, and there is no state law requiring municipalities or counties to sign their business routes. So unless the business route happens to overlap a state highway, the business route is more than likely unsigned. But with that said, Caltrans hasn't really enacted many new business routes (I can think of one on SR 58 at Mojave and another on SR 4) in the past ten years. Very few business routes remain in Southern California (I-10's loops for places like Indio and Colton are largely unsigned and therefore decommissioned, except for a couple of remnant shields), and I think they are getting less and less frequently found on rural freeways such as US 101 (Paso Robles), I-80 (Truckee), and I-5 (Redding). I am sure others on the board can cite additional examples. In general Caltrans seems to be interested in removing Business Routes when possible. When the CA 43 roundabout was completed last year the Business Route 198 signage was removed entirely. Most of the Business Routes I encounter are just a single guide sign or shield which likely was part of a higher degree of signing. The western half is also I-305, and there are no signs for that either. As for the idea of BS 80, I kind of like it, for the reason you stated above. I see this trend as a function of the use of GPS and onliine mapping services available while driving. In the past, if you wanted gas, food, lodging they were found right on the highways. As individual bypasses were built, people who wanted to partake of those services could generally find them along the old highway corridor. And for many small cities, you can get directly to the old highway corridor by taking the first exit of the town, follow the old highway through town and be deposited right back onto the freeway at the other end. It was important for people to know that they could simply keep driving in the same direction to get back on the road, as opposed to doubling back and heading back to find an on-ramp where you exited (in some cases the ramps to business routes are unidirectional and don't serve the minor direction). But now, your online service can tell you where the services are and how to get back to the freeway. So the need for such signage has diminished greatly. I, like many of you road enthusiasts, enjoy driving business routes to get a feel for a town that I may be passing through. Take an extra 10 minutes to see what there is. Try to imagine what it is like to drive this road back in the 1920's and 1930's when this was the main road. But it is harder now that the signage is gone and outside of certain historical examples like US 66, the municipalities don't really seem to care. That being said, I don't have any nostalgia when I drove Biz-80 in the late '90s when I lived in Northern California. It was a freeway and its purpose was to get to my destination as quickly as possible. If I wanted nostalgia, I would drive the true business route through Sacramento along West Capitol - 16th- Del Paso -etc. Oddly enough, I would have less of a philosophical problem if the Tower Bridge Gateway (back in the '90s this was a freeway connector between the bridge and I-80, now its largely a surface route) and CA-160 freeways [and the surface streets in Downtown Sacramento between them] were signed as Biz-80 as this followed the old US 40 corridor and actually led to some businesses. And it provided a decent way to get a feel of Sacramento and then guide me back to I-80 to continue my journeys. I forgot about Biz-376. That designation is relatively new, so I didn't think of it. IMO it should also be replaced with a new state highway number, but discussion of that should be in teh Northeast or Fictional boards. I have no objection to removing business routes. I do have an expectation that a business route will meet its parent at both ends. I've seen business spurs on occasion. That could be a solution, but it's probably better to get rid of the business route designation entirely. Biz 80 is a (now) 36-year-old experiment that hasn't had the results Caltrans and Sacramento originally wanted -- to provide an in-town through alternative, not necessarily to Interstate standards -- to the relocated I-80 around the north side of town. However, no one really utilizes it as such; it is simply a series of disconnected sections; the relatively slow-speed Oak Park turbine interchange never helped to define the route as a through facility. And seeing as the E-W (W/X + West Sacramento) freeway segment is formally part of California Route 50 (that just happens to be a US Highway -- Caltrans, except for purposes of standards & sometimes funding, doesn't distinguish on the master list), signing it (apparently only on BGS's and not with reassurance shields) as US 50 is a no-brainer. But apparently Caltrans has no real idea what to do with the CA 51 segment -- sign it as such would be the obvious choice (when means they won't even consider that!) -- they'll just keep the Biz 80 signs up for the foreseeable future and hope nobody in the field lodges any complaints regarding continuity (they're probably hoping the "To I-80" signage on and leading to westbound will suffice). Poor signage seems to be an agency-wide issue rather than one endemic to one district or another; Caltrans seems just not particularly interested in providing consistent navigational aids. Of course if CA 99 ever gets Interstate status & signage, what to do with I-7 or I-9 once it hits Sacramento (unless truncated at Stockton per some plan variations) might well toss an additional monkey wrench into the signage situation (take it over to I-5 or all the way to I-80 along with US 50 -- but because of the substandard CA 51 segments, they'd probably not route it up that corridor -- although it could be signed (lazily, IMO) "To I-X" southbound and To I-80" northbound -- but if the whole assembly would read CA 51/TO I-80 NB and as the same but with the new I-designation SB, to me that would be the optimal solution for that route at that time (just speculating!). Since Business 80 never became a popular through route, I think Caltrans might as well abandon it. The US 50 section is easy, sign as US 50 only. The CA 51 section is more problematic. I do not agree with making it part of CA 99 - it makes following CA 99 to the northern section problematic. Maybe the southern section and northern section should have different numbers - if the southern section became I-7 or I-9 that would be simple, but would still leave us wondering what to do with CA 51, because it doesn't meet interstate standards. I say drop the Business 80 designation and sign it as CA 51. With accompanying signs southbound "To CA 99 SOUTH - Downtown Sacramento" and northbound to "To I-80 EAST Roseville - Reno" it should be clear enough. "9 South - Fresno; 9 North - Reno"
Also, it is nice to see all the overhead freeway signs being replaced. But, I have noticed that the new signs installed throughout the Sacramento area seem to be blistering and peeling a lot. I hope what appears to be thin, plastic coating that is currently blistering and peeling off of the new BGSs is not the material used to reflect headlights of oncoming traffic. Otherwise all those new signs will need to be replaced in less than five years. Nonetheless, I say good riddance to the bad rubbish that was the original concept of "Business Loop 80" in Sacramento. As a life long resident of the Sacramento area, I never liked the concept. US 50 and Interstate 7/9 works well for me. That all sounds great but CA 99 needs a massive amount of upgrades to meet Interstate standards. Given some of the chatter Andy cited regarding the I-710 extension I don't see any chance in hell that 99 will be upgraded any time soon. There are way too many soft shoulders, narrow lanes, and right on/right off ramps to get anyone interested in Interstate upgrades. Since the multiplex to that northern section of 99 is presently all but silent why not just change the legislative definition of route 99? The section of 99 north of I-5 would be more fitting as it's own route, maybe something like CA 499? That way the legislative definition of 51 could be absorbed into a 99 that meets I-80.